For very many years now, the SWMC has attended the annual exhibition of the BSMEE, held at Thornbury Leisure Centre over three days in August. This year's event was supported by Sam, Steve, Mark, Pete and myself. Our models were equally varied and demonstrated the versatility of Meccano very effectively. Sam displayed a range of fire engines from different Meccano set instructions over the years, an early tank, a beautifully built Supermarine Spitfire and a Hawker Hurricane. He also brought a working tower crane which was a particular hit with youngsters who were able to operate it remotely. Pete brought a wide range of items including his carousel which had run trouble free until the motor gave out. This was rectified with a new motor and all was well again. Also on display was a completed vintage aeroplane constructor kit, alongside an unmade aeroplane constructor outfit No. 1,a modern harrier jump jet, and a lovely assembled example of the Meccano Concorde. Finishing his aeronautical theme was a blue bi-plane. On wheels instead of wings was a large collection of early constructor cars, plus one non constructor car and a couple of very smart MG cars. 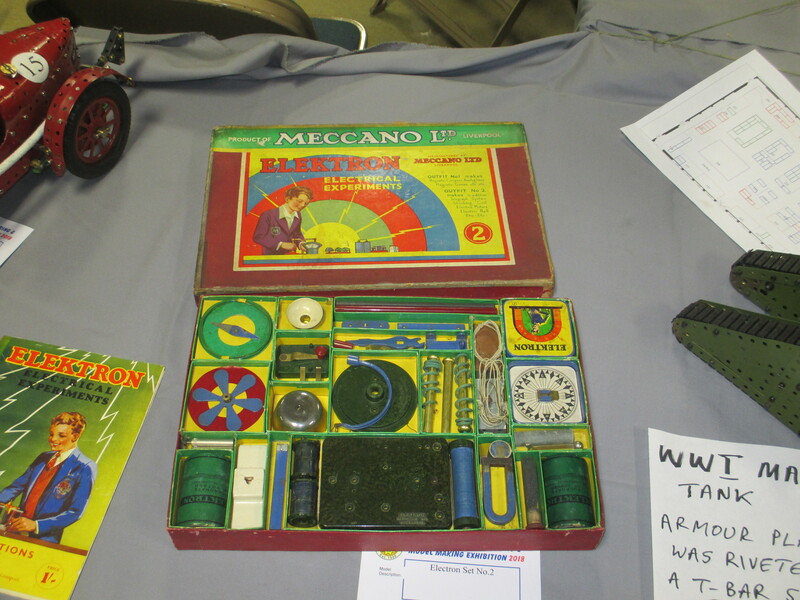 There were also some Meccano vintage tin boats, and an unusual Meccano Elektron set still in its box. To entertain the children (and adults!) he brought along a bagatelle game which first saw use several decades ago, but still as popular as ever. He also brought some beam engines to display. Steve displayed his ongoing build of the USS Missouri, now sporting some hull cladding on the Port side which is really bringing the model to life. Steve managed some minor technical gremlins very ably and vowed to make some modifications to ensure it will be more exhibition tolerant in future! A short demonstration video can be seen on this link to YouTube. He was constantly answering many questions from fascinated visitors, including two who had recently visited the real ship in Hawaii. A channel presenter from 'You Tube' filmed a short interview about the model, which hopefully will show Meccano in a fair light given that the channel's name is 'Dubious Engineering'! This can be seen on YouTube Massive Meccano USS Missouri Battleship. Chris brought along his Bristol Dockside diorama, based around his large Stothert & Pitt crane, of which the real thing is still functioning outside the M-shed in Bristol docks. This model worked really well and was very popular with visitors, many of whom immediately recognised the local prototype. Also on display was his red and green tanker lorry. Mark brought his Congreve clock. This is a fascinating creation but extremely sensitive to external influences. It certainly ran best early in the day, before the room became really quite warm later on. A few deft tweaks to the balance weights usually saw it working again but models like this don't take kindly to being moved. I kept things simple this time, bringing along my Hannover biplane, Lotus F1 car and Mechanised Army half-track. This event is arguably a bit too long at three days, but less tiring when several of us all share the job of manning the stand. Without doubt this event is the main 'shop window' for the SWMC and the visitors are always interested and well-informed. A number of people were very interested in the club (we have picked up new members at this event in the past). Thanks to all those who made this event possible.